Drops of water formed by the condensation of moisture in the air is dew. Dew occurs when the moisture in the air is cooled to its dew point. Dew drops assumes the shape that minimizes the sum of its gravitational energy and its surface tension. Surface tension is expressed as force per unit length. Water has a surface tension of 0.072 N/m. The shape of a dew drop cannot be described by a closed form mathematical function. The governing differential equations do not have a closed form solution, so must be integrated numerically to trace the profile of a drop (cf. The profile of a dew drop). 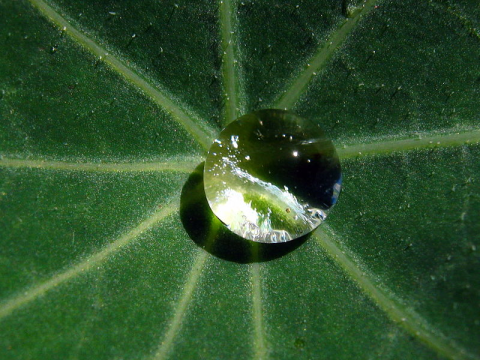 A drop of dew cupped in the leaf of the common garden nasturtium. 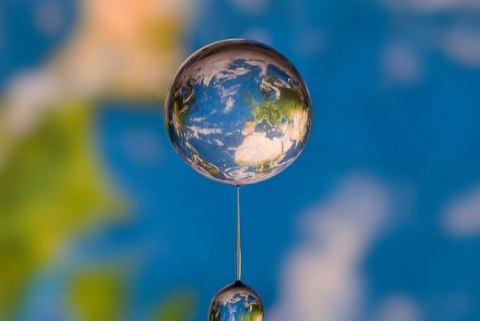 The term refraction describes the deflection of light that occurs when light waves travel through a change in medium (e.g., from air to water). Water droplets refract light like a lens. - Travels in Alaska by John Muir, 1915, chapter 1, page 5. Photographer Markus Reugels uses the refraction of light in water to create still life images in a drop of water. Muir, John, Travels in Alaska, 1915. Feredoon Behroozi, Hilliard K. Macomber, Jack A. Dostal, Cyrus H. Behroozi, and Brian K. Lambert, The profile of a dew drop, American Journal of Physics. September 1996, Volume 64, Issue 9, pp. 1120. Liquid Art by Markus Reugels. Liquid Sculptures. Pictures of drops.